Deep Silver and Volition have announced another piece of what diehard fans of the Saints Row franchise can look forward to when the game launches later this summer. Pre-order Saints Row IV and you’ll get the “Commander in Chief” edition pictured above. You can read more about each individual item in the press release below. The ‘Merica Weapon reminds me of one of my favorite scenes from the worst (if “worst” is even possible with this outstanding trilogy) entry in the Beverly Hills Cop series of flicks, Beverly Hills Cop 3. Warning: language and mildly NSFW imagery. We’ll have more on Saints Row IV as it comes. Thank goodness this one survived the THQ bankruptcy, right? It will release on August 20th in North America for the Xbox 360, PlayStation 3 and PC platforms. The “Commander in Chief” edition is free to those who pre-order the game. The title will sell for $59.99 on consoles and $49.99 on PC. 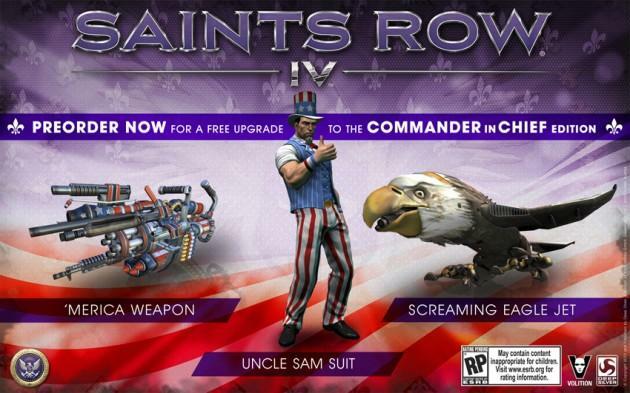 All hail Potus as Deep Silver announces today that the Commander in Chief Edition for the upcoming Saints Row IV is available as a free upgrade to pre-orders at major freedom-retailers across North America. In this ball-busting, open-world and-other-PR-words installment in the Saints Row franchise, developer Volition continues the story of the Third Street Saints by elevating their status to the highest level – the leaders of the free world. But the leaders of the free world are under attack from an alien invasion in the land of the free, and it’s up to you and your gang to save the world, Saints-style. To help you combat the alien terrorists you will encounter, the Commander in Chief Edition is a free upgrade for all pre-orders at participating retailers and comes fully loaded with a Screaming Eagle that fires rockets out of its talons and can invoke the “Sonic Scream” attack, leaving your enemies dazed, confused and likely scarred for life. Additionally, if you’re going to save the world you should look good while doing it, which is why the Commander in Chief gives you a limited-edition Uncle Sam uniform, made in the US of good ‘ol A. And since you need the best [read: most ridiculously overpowered weapons ever conceived] fighting tools available, Volition and Deep Silver are giving you a stimulus package, “’Merica”, full of incredibly astonishing firepower: flamethrowers, ultra-powered dub step guns and rocket launchers are yours for the taking. Crown thy good with brotherhood, indeed. The Commander in Chief Edition is priced at $59.99 on console and $49.99 on PC. The Commander in Chief Edition will be available globally.